There Are Quakers in the South Bronx!? For three hundred years Friends braved social conflict and sought justice. Yet, today we often feel troubled or confused by conflict. We face it. We try to smile thinking, “Opportunity to grow.” Still our hearts cry out, “Avoid bad feelings!” Have we lost touch with our tradition? Or may our ambivalence actually be inviting us and our Society to grow? Perhaps considering our peace tradition in relation to a peace-seeking martial art, may clarify our wavering at conflict to reveal Way opening. So it has been with me. I'm writing in the Peace Zone office of Iglesia San Juan Bautista, a tiny Latino Episcopal church, before putting on my dogi uniform and leading its Peace Dojo. I share the space with Peace Zone’s director, Santos Bobet, a former drug dealer, who found enlightenment and a life mission from his prison relationship with an older member of La Asociación ÑETA (considered a “gang” by the authorities). Over the last few years his organization has renewed and renamed itself "La Asociación Pro Derechos del Confinado" and developed in the spirit of nonviolence. Santos has learned the effectiveness of nonviolence and has brought young people in from the street sharing with them his own knowledge of nonviolence. He gives street credibility to the SJB Peace Dojo which I lead . The path that brought me to this place and this work was long. Gerry Smith of Fifteenth Street Meeting during the sixties had been teaching at a South Bronx middle school. I, a non-Quaker, at the end of the sixties had been “witnessing” with the Ghetto Brothers, a large street organization (officially termed a “gang”) in the area. In 1971 when Gerry and I met he asked me, “What do you need?” I needed to produce a video. Gerry simply came through and together we shot and edited members' reactions to a then-current anti drug campaign. The production helped change drug advertising in 1973 — in 1976 I became a Quaker. I had witnessed the Ghetto Brothers respond to the killing of their Minister of Peace. Yellow Benjy said, “Black Ben was about peace. The GB’s are not going to war over his death.” He assembled 100 gang leaders. Without the help of mediators, social workers, or teachers they negotiated a peace agreement that held for about 10 years . Watching those organizations I observed that the most effective peacemakers were martial artists. I was impressed enough to take up aikido, a nonviolent martial art, in 1983. To my surprise I learned that its core principle is love! Since I had become a member of Fifteenth Street meeting I presented my leading with an Aikido demonstration at the Meeting House in 1985. My Meeting sent me on to Bullshead-Oswego Monthly Meeting to learn about Alternatives to Violence Project (“AVP”) from one of its founders, Larry Apsey and from Steve Angell. I quickly completed AVP Facilitator Training and set about integrating Aikido and AVP with the encouragement and help of many. Forty years after I began to work with South Bronx youth organizations, I still work there. Instead of witness I head Urban Visions, Inc. (http://urbanvisionsinc.org) which develops projects in nonviolence. I am a Quaker peace warrior; as I often termed Larry Apsey and Steve Angell. They sought peace and struggled for justice physically, mentally and spiritually. I set up, tested and now run a “peace dojo” model that integrates Alternatives to Violence Project and Aikido methods as a comprehensive physical and verbal nonviolence training. Urban Visions has peace dojos in a Manhattan public school and in the South Bronx — both the Episcopal Peace Zone youth project and Presbyterian GrandParents Family Apartments. Its model has spawned similar peace dojos in Los Angeles, Goshen IN, Awassa Ethiopia, Sao Paolo Brazil and Chicago. What happens in a peace dojo? Affirmation, Attention, Trust, then Transformation occurs in the person and the group. The order is important. First Affirmation: We repeat failed behaviors, because you are afraid of losing the little that you have. When we affirm we can grow and loosen the hold of fantasy and fear. Then Attention: You We can pay attention to reality both internal and external. We notice that we are not alone, but rather surrounded by potential allies and resources. And Trust: We build a sense of community and trust, because we are positive and responsive and others need those qualities, too. Finally Transformation: It occurs when we let go of fears from the past and fantasies of the future to connect wholly to the person in front of us (whom previously we had considered an adversary). That connection is musubi in Japanese, it is the conduit through which Transforming Power flows irresistible into a crisis to find in it an opportunity for new growth. Affirmation, Attention, Community and Transformation may seem concepts, but all have equivalent physical states which must be perceived and then understood, trained and used skillfully. Affirmation applies to Center, an awarenesswhich seems to be deep in the body below the navel. Attention which arises from that Center does not stop with a gaze but extends through all perception in and around the body and in Japanese is called zanshin. Community awareness flows naturally from true Attention, because you know the intentions from nuances and hints. Transforming Power is the integration of all these states, in Japanese musubi (more accurately, iku-musubi). “Transforming Power Stories” are a part of AVP and of peace dojos. One of mine happened on Lexington Avenue and Fifty First Street in Manhattan. A crowd was ahead at the intersection. I stepped out on the curb just as an African American lady started to move toward the focus of the crowd: two youths fighting in the street. I moved right behind her and as she started to extract and calm the younger, smaller youth from under the larger one, I caught the latter’s arm gently preventing him from hitting the youth he had been pounding. Without talking to each other the lady and I cooperated in separating the fighters until each went his way as the lady and I also did. Transforming Power had brought us together and directed our wordless physical, mental and spiritual cooperation. The spontaneous spirit of play is an aspect of Transforming Power. 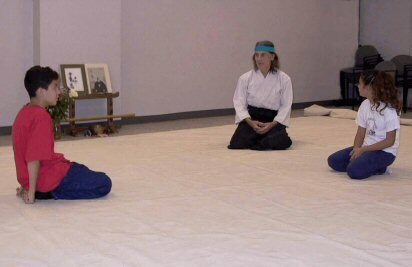 Children and adults in a peace dojo have fun or they wouldn't continue. They bow together at the beginning to show respect and readiness to play and learn. They warm their bodies with exercises that enliven muscles and establish perceptual and movement patterns. Most importantly they learn to breathe together. When they practice verbal skills, they notice how their bodies feel and react. When they do physical techniques, they notice what words would go with the actions. They learn to meditate emp tying the clutter of mind and body habits. They play the Kitty Game to find natural movement and community with others. They assemble in Council Circle to solve and celebrate group problems and achievements. It is my time to give back in the Bronx and elsewhere what I have learned. On the board of Aiki Extensions, Inc., an international association of aikidoists I advocate for the needs of youth and the unity of nonviolence, verbal and physical. From the Bronx and elsewhere aikidoists concerned about peace and justice have joined me. Street organizations, schools, agencies and religious institutions have become interested in how nonviolence can gain justice peacefully. Although a member of the rural Bullshead-Oswego Monthly Meeting, I travel to the Bronx a few days each week. Moreover my meeting has lavished time and concern in my clearness and oversight committees, trying hard to teach me how to ask for and use spiritual support. Members have welcomed my Bronx associates to Bullshead and attended peace dojos and the Bronx Worship Group Larry Apsey advised me early to wait until “Way opens.” Others have given me contacts and held mein the Light as Way is opening .